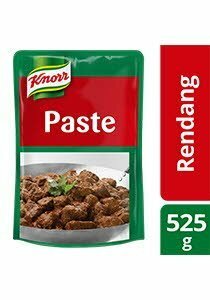 Specially formulated for food service operators, Knorr Rendang Paste is made with a blend of good quality curly red chilli, cumin, clove, coriander, cinnamon, cardamon, star anise, fenugreek into a paste format for easy application & versatility..
Palm Oil, Salt, Chili Paste, Flavour Enhancer (E621, E635), Garlic Powder, Cardamom Powder, Star Anise Powder, Coriander Powder, Fenugreek Powder, Cumin Powder, Cinnamon Powder, Caramel, Acetic Acid, Clove Powder, Lecithin (Contains Soy), Edible Gum, Modified Starch, Citric Acid and Preservatives (E202, E211). All food additives used are from plant and synthetic origin. May contain traces of cereal contain gluten, egg, milk, crustacean, fish, mustard and peanut. 1 kg of Beef for servings of 15: 1. Heat 20ml oil in wok, add 75g of Knorr Rendang Paste and 100g of chilli paste. Stir-fry until fragrant. 2. Add 1kg beef meat, turmeric leaf, 1L water & 8g Knorr Chicken Seasoning Powder. Stir well. 3. Bring to boil, then simmer for 1 hour. 4. Add 1L thick coconut milk, then simmer again for 1.5 hours. Stir occa ssionally until ready to serve. Store in a cool and dry place. Use clean spoon and close pack tightly after opening.